Born in Rochester, New York, Emile Gruppe became a renowned New England landscape and marine painter. His modern style was largely inherited from French Impressionist Claude Monet. 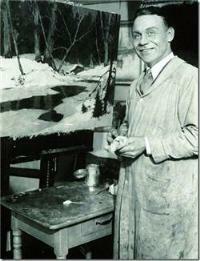 He was the son of landscape artist Charles Paul Gruppe, and had a very strong art background. In addition to being raised by an artistic father, he was also educated in art at The Hague in the Netherlands and in New York City at the National Academy of Design and The Arts Students League. He also received instruction from artists George Bridgeman, Charles Chapman, Richard Miller and John F. Carlson, with whom he would later founded, in 1942, the Gruppe Summer School in Gloucester, Mass where he made his permanent studio. His artistic career had begun in 1915, but was briefly interrupted in 1917 when he spent a year in the United States Navy. Gruppes prolific career brought him many awards and memberships. His popular painting “Winter, Vermont,” date and location unknown, won the Richard Mitton Award at the Jordan Marsh Exhibition in Boston in 1843.